CCTV Drain Services are certified surveyors and on request can provide a comprehensive CCTV drain surveys of a domestic or commercial property. All the information regarding the drainage system is produced in a report using a view-line software. The software allows us to use our CCTV to look at the images on a monitor in our mobile unit. Our technicians can inspect the footage from damages and cracks to the drainage system. The information collected in the report will give a clear view of the condition of the pipework and the necessary action needed with any problems arising. From this information, any repairs needed where applicable can be addressed. CCTV drain surveys can be carried out on any kind of drainage system. We offer regular maintenance checks every 6 to 8 months to check the drains from any problems such as future blockages, tree roots, damages, cracks, problems with pipe joints, collapsed pipes. We can also use our CCTV drain surveys to inspect drains after repairs are complete to ensure the drain is running as good as it should be and that all problems have been fixed. Once we have carried out a CCTV drain survey we show you the footage of the problems and explain what’s causing it. Our technicians will then discuss with you the best possible course of action to get your drainage system backup and to run. It is imperative before surveying that the system is cleared with high-pressure water jetting for the removal of grease, fat and any other waste deposits that could obscure the view of the camera and conceal any defects, cracks or fractures. If you have problems with drains and would like Certified Drain Services to come out and inspect your drains using our CCTV drain survey, then give us a call today: 0800 234 3624 or send us an email at info@certified-drain-services.co.uk. The majority of drains are located underground, so it is hard to diagnose any existing or potential problems. The benefits of having a CCTV survey are an accurate identification of the drainage problem at hand and the structural layout of the foul/storm systems being surveyed. 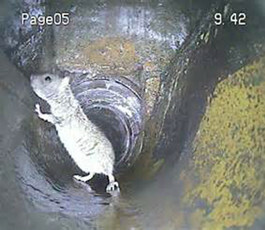 Please contact the team if you require any further information or advice on CCTV drain surveys.